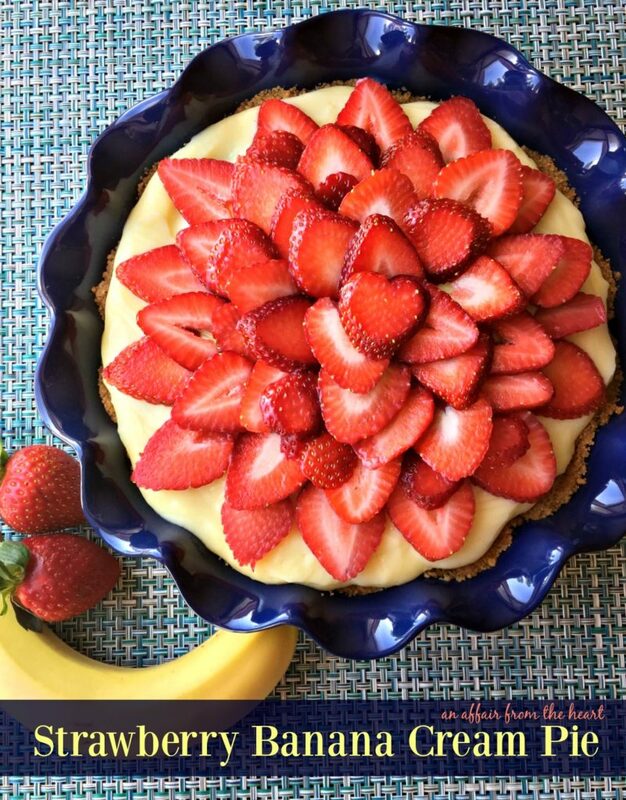 Graham cracker crust, filled with a vanilla custard and bananas, chilled then topped with fresh strawberries before serving. Beautiful presentation and so scrumptious! 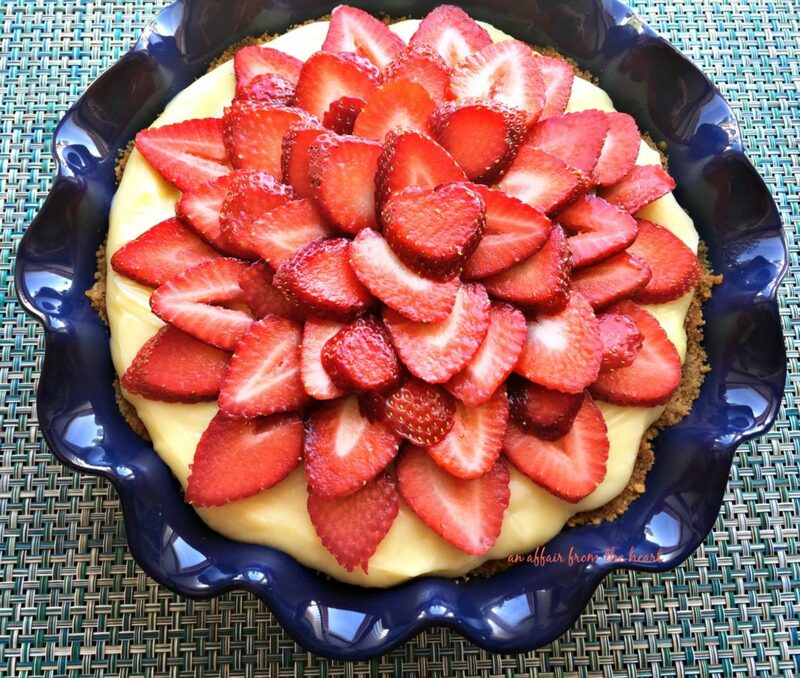 I know … I have been posting a lot of strawberry recipes lately. How can I not? The strawberries have been SO GOOD! We just can’t get enough of them this time of year. I love to make pies, and have quite the collection of them on my blog. One of my family’s favorite pies that I make is my Banana Cream. 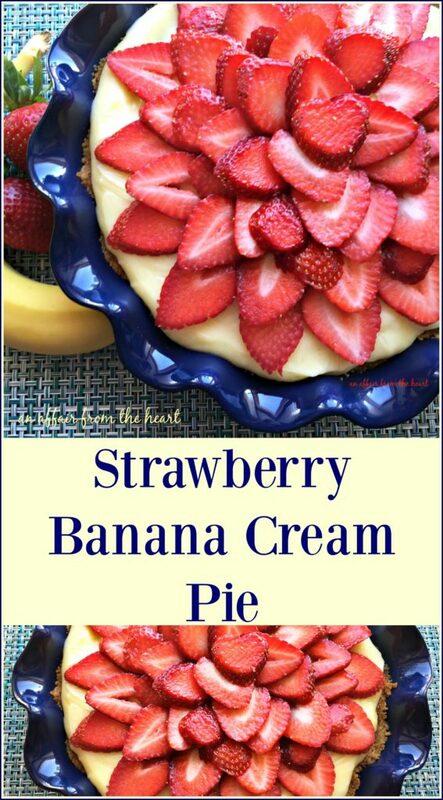 When browsing my assigned page for Secret Recipe Club this month, Well Dined, this Strawberry Banana Cream Pie just leaped out at me! Oh, sure, there are TONS of other things that I could have made; like this Greek Style Zucchini Salad or these Salty Peanut Butter Swirl Brownies. This isn’t the first time I have been assigned Sarah’s blog. 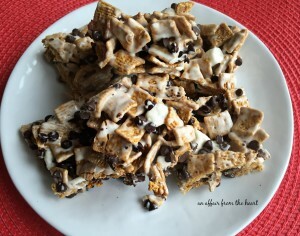 Back in November, I made her recipe for S’Mores Treats for a Holiday Baking theme. Sarah is an avid home cook, and also reviews restaurants on her blog, Well Dined. She cooks and bakes more on the healthy side, and you will find some tasty seafood dishes on her blog, which I love, like this Lemon Ricotta Pasta with Seared Scallops. This pie was so delicious! It had a very subtle banana taste, as the custard is vanilla flavored and banana slices are layered in between. The crust is made from graham crackers, and it has a light cinnamon flavor. 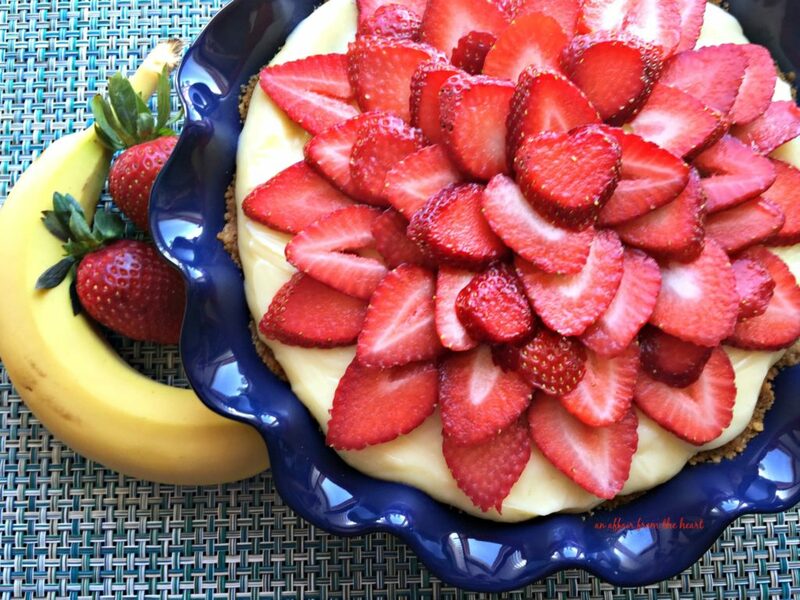 Topped with strawberries in a “spoke pattern,” right before serving. Isn’t the presentation beautiful? I love that bright little heart-shaped strawberry in the middle! Mix graham cracker crumbs, sugar, melted butter, and cinnamon until well blended. Press mixture into a 9 inch pie plate. Bake for 7-10 minutes. Cool. To prepare the custard: Whisk 2 cups of milk, with the sugar and salt in a medium saucepan, over medium heat and bring to a boil. In a medium sized heatproof bowl, whisk remaining 1/2 cup milk with the cornstarch. Whisk the egg and egg yolks into the cornstarch mixture. Slowly whisk about 1/3 of the hot milk into the cornstarch mixture. As milk continues to boil, whisk warmed egg mixture back into milk, whisking constantly until mixture comes to a gentle boil. Continuing to whisk constantly, mixture will begin to thicken within minutes. Continue whisking and cook for 30 seconds more. Remove from heat and whisk in butter and vanilla. Pour half of the hot filling into the pie crust. Arrange sliced banana. Pour the remaining half of the filling over the banana, scraping the pan clean with a rubber spatula. Use the spatula to smooth over the top. Press plastic wrap directly onto the filling and refrigerate the pie until cold. (at least one hour) Before serving, let the pie sit at room temperature for 30 minutes. Arrange sliced strawberries in a spoke pattern over the top just before serving. I had vanilla graham crackers on hand, so I used them for the crust. I will be doing that again! GREAT flavor! Thank you for the great recipe, Sarah! Are you interested in cooking/baking along with us in The Secret Recipe Club? Click the banner below to find out more information and sign up to join us! What a gorgeous presentation! Who wouldn’t be proud to serve this lovely? That looks positively amazing. And what great flavors, too. Thanks for sharing with the SRC. Beautiful pie! Great combination of flavors….love your SRC selection. Kathy – Thank you for the kind words! Gorgeous photos! Thank you for the kind words! Thanks! and THANKS for the great recipe! Looks crazy yummy. You did a fantastic job of putting that together. Love how the top berry looks like a heart. I saw this recipe on a Facebook post & was immediately looking for your blog to see how to make it. I mean, how can you go wrong with strawberries, bananas and custard! And the presentation is beautiful! Gorgeous picture! And I love that it’s just a subtle banana flavor. Pinning. Beautiful photograph of the dish. MHhh, that looks so delicious! That is one beautiful pie!! Do you need a taste tester?!! Wonderful recipe! Thank you so much!